Nearly everyone has experienced the pain of hitting their "funny bone," along with the tingling sensations it causes that run down the arm and into the pinky finger. Within a few moments, the sensations fade and are quickly forgotten. However, sometimes the same pain, tingling and numbness in a pinky finger occur without any injury. Some people may wonder if sleeping on their hand caused the sensation, but what if the feelings do not go away? Does it indicate something really serious? What Causes Numbness in Pinky Finger? For numbness and tingling sensations that go away soon, there is nothing to worry about. You may have just touched the wrong point of your hand and arm. However, in some cases, the numbness could indicate an underling condition. Ulnar neuropathy, which is also called cubital tunnel syndrome, occurs when pressure is placed on the ulnar nerve. This nerve is just under the skin's surface near the area of the elbow called the “funny bone.” Cubital tunnel syndrome may develop if you frequently lean against your elbow, especially on hard surfaces, or if your elbow is bent for extended periods of time, such as when you tuck your hand beneath a pillow throughout the night while sleeping. Cubital tunnel syndrome can also be the result of abnormal growth of the elbow bone or any intense activity affecting the ulnar nerve. Your doctor may be able to diagnose the syndrome with a physical examination or he or she may need to do a nerve conduction study to make an accurate diagnosis. If the compression of the nerve is too severe or if the therapies are ineffective, then surgical intervention may be needed to relieve numbness in pinky finger. The majority of patients respond well to surgery used to relieve pressure on the ulnar nerve. This condition occurs when the ulnar nerve is compressed within the tunnel in the wrist called the Guyon canal. The ulnar nerve runs along the side of the neck, down the arm behind the elbow and down to the ring and pinky fingers of the hand. The symptoms of Guyon's canal syndrome often start with a tingling or pins and needles sensation in the ring and pinky fingers. This sensation gives way to a burning feeling within the wrist and hand. Afterwards, the pain may be followed by numbness and clumsiness when using that hand. Some symptoms are also caused by a fracture in the wrist called a hook of the hamate bone. This fracture commonly occurs in golfers and baseball players. To help ease pain and inflammation, your doctor may suggest taking an over-the-counter anti-inflammatory, such as ibuprofen or aspirin. However, if this fails to relieve your symptoms, then he or she may recommend surgery. The surgical procedure includes making an incision in the palm of your hand to help relieve the pressure on the ulnar nerve. Numbness in pinky finger may also be caused by damage to the nerve on the injured side of the finger. There are small nerves, which measure only about two to three millimeters in diameter, in the finger that run along each side. Damage to the finger's nerves may occur due to cuts or a serious hand injury. The only way to restore feeling to the finger is to have surgery on it to repair damage to the nerve. 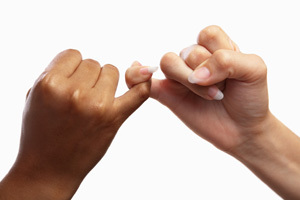 Diabetes, though not common, can be one of the causes of numbness in pinky finger. Diabetic neuropathy may be caused by either long-term exposure to elevated blood sugar levels or poor blood circulation. The early symptoms may include tingling or numbness in the toes or fingers. Over time, the areas that are affected can go completely numb. Diabetes can also cause chronic inflammation that damages the structures of the nerves, leading to numbness. A blood clot or damage to the blood vessels can lead to decreased flow of blood to the brain, which can result in a stroke. One of the indications of a stroke is a sudden tingling or numbness in the extremities, such as the fingers, along one side of your body. If you experience these symptoms, you should seek immediate medical care. The median nerve runs through a narrow passage in the palm side of your wrist, known as the carpal tunnel. 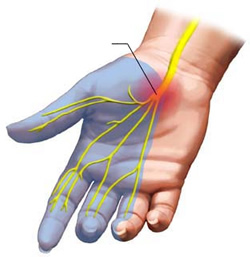 If this nerve is compressed, it can cause tingling, weakness, numbness and pain, which is called carpal tunnel syndrome. However, this affects the thumb and first three fingers of the hand but NOT the little finger. How do You Die from Alzheimer's?